Mesh Ergonomic office chairs are specifically designed to aid your posture when seated up to your office desk. 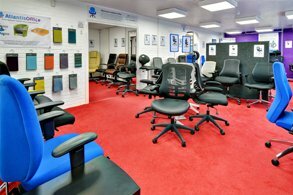 Ergonomically friendly chairs can help you to work efficiently and effectively by reducing user fatigue and discomfort. Ergonomically designed office chairs follow and contours your back. The main features of an Mesh ergonomic office chair include, height adjustable armrests, some armrest are padded to further your comfort, adjustable back height with built in lumbar support, height adjustable gas lift, and a fully synchronised tilt to seat and back rest. Mesh Ergonomic office chairs are perfect for hot office days and available in an array of colours. The Atlanta is an attractive and beautifully crafted chair, designed to please both the eyes and bo.. The Vegalite is our stylish, executive Mesh Office Chair which is perfect for anyone looking for com.. The Stanford chair has a curved mesh back, as well as a shaped seat and cushioned arms. This gives .. The Solaris is our mesh back operator office chair suitable for any office environment. It features.. The Marlos is our mesh operator office chair. It is available in a choice of 4 bold colours (Red, Gr..
New style pivot arm5 Star base in black with 50mm castors Deep Uph.. The Dakota is our new and elegant mesh back manager’s chair, which has been made for your comfort a.. The Swindon is our high mesh back task chair with a bonded black leather waterfall seat. The Swindon.. The Zeus offers a breathable mesh backrest along with an air mesh seat with stitching detail as stan..
Stock Due Approx.  Mid OctoberThe Spalding is a Black Mesh High Back office chair with integrated lum.. The Tuscan is our full black mesh high back operator chair, it features a head support and pivoting .. The Vortex is a funky, modern, simple and new designer chair which offers contemporary styling and ..
Filey Mesh Task Chair with stunning white frame and base, perfect for the home or commercial office.. Contemporary mesh executive chair with lumbar curved aerated backrest. Features removable headrest a.. The Fonseca is our ergonomic operator office chair, it features a mesh backrest with a PU leather s.. The Ergo Comfort Mesh is our ergonomic mesh backed operator chair suitable for any home or commercia.. This is a popular all round chair for home and office. Features a pleasing mix of air mesh fab.. The Portland is our new ultimate all-in-one chair. It features a large, stylish mesh back surface sp..
Vegas black Mesh Executive Office Chair Leather headrest for support and comfort Soft me.. The Fuller is our Mesh Operator Office Chair, it features folding height adjustable arms, breathable.. The Reading Leather Seat Office Chair features a breathable mesh back which is available in bla.. This is the Zico, our breathable mesh chair with added lumbar support for ultimate comfort. This ch.. The Palma is our mesh executive office chair, it features a breathable mesh back as well as height .. This is a popular all round chair for home and office. Features a pleasing mix of air mesh fabric se.. The Reading Airmesh Office Chair features a breathable mesh back, folding arms for ease of.. The Salford Leather Operator Office Chair offers a silver or black mesh back along with a blac.. The Altino 2 lever operators mesh back chair offers seat height and lockable back tilt as standard.. The Curva is our high back ergonomic mesh chair, it has been designed with a sculpted molded mesh se.. The Napier is our mesh operator chair which is suitable for almost any home or commercial office env.. The Kempes Mesh Operator Office Chair is ideal for any home or commercial office. It offers height .. The Levante is our mesh back operator chair, it features a bonded leather seat, a black 5 star nylon.. 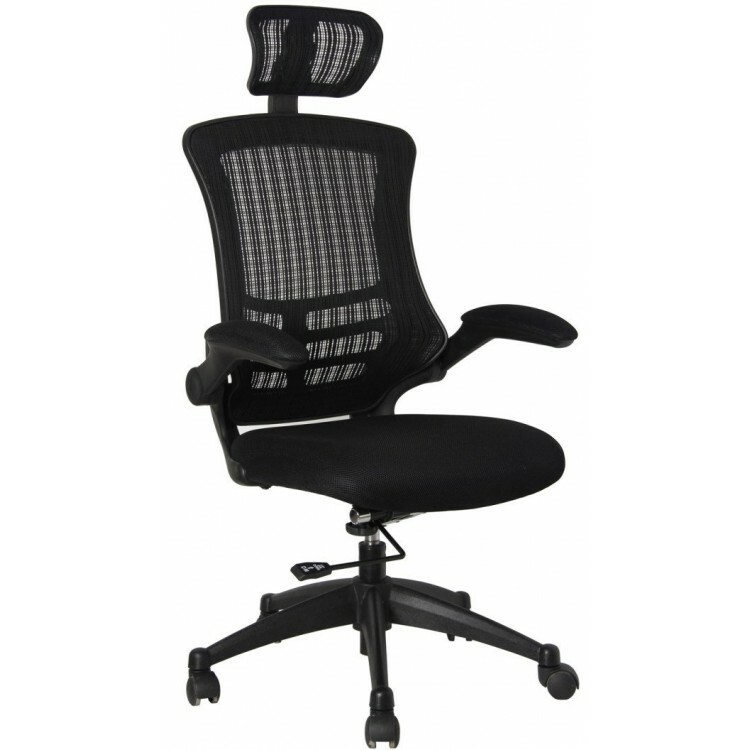 The Salford Airmesh Operator Office Chair offers a silver or black mesh back along with a.. This is the Maldini our black with a white frame breathable mesh back chair. With added lumbar supp..
Black Mesh BackAdjustable lumbar SupportSoft mesh cloth seatSeat available in a variety of coloursAd.. Superb Value Mesh Chair for those who want the modern look without the big price. Ratch..
Waverly Simplicity Posture Chair features a padded Air Mesh seat with a height adjustable mesh back.. Luxury mesh back executive chairAvailable in either black or blue meshBreathable seat padMulti-adjus.. Designer Multi-Functional Mesh / Fabric Chair Black Height adjustable back Chrome 5 Star Base .. The Flint uses modern materials to create a chair that is practical and innovative with fe.. The Norton is our Mesh Back operator office chair which features a synchronised reclining mechanism,.. The Chachi is our full mesh office chair, it offers a high back for maximum user comfort, an ad.. The Regent is ergonomically designed and has a luxurious cold cure foam seat that provides a pleasa.. The Portland HD is suitable for use in any home or commercial office environment. it is our 203kg (3.. The Mirage II Chair is our executive office chair available in black full mesh. It features adjustab..